Typically, its practitioners – many of them Gypsies – perform music in the style of the Hot Club of France, almost always using phrases from Django’s early vocabulary, and sometimes even performing his solos note for note. There is little progressive improvising in Gypsy Jazz. There are some great musicians who play “Gypsy Jazz,” and it has its own niche fan base. It’s just not what Django was all about. What is important to remember is that Django was a jazz musician, not some Gypsy, folk, world music hybrid musician that the title “Gypsy Jazz” suggests. Most of the major annual festivals that honour Django’s music, usually employ one or more of these “Gyspy Jazz” musicians/groups. A problem that arises as a result is that audiences come to think that what Django played was this “Gypsy Jazz,” completely separate from the American jazz he played. Worse, some of these players are less than capable jazz improvisers. Fine musicians, but not jazz improvisers at the level of Django. (Then again, who could be?). The First Generation are contemporaries of Django, but are limited to those guitarists who were active professionally while he was still alive, but limited to those whose actually recorded during Django’s reign. There are guitarists who were indeed active during this period and also recorded, but they simply didn’t come into their own to receive what little recognition they got. Tchan-Tchou would be a perfect example. Note: These are not complete lists, general, known players names are used (and some obscure ones as well) The first generation, early 1930’s to the early 1950’s: Matelo, Baro, Sarane and Challain Ferret, Eugene Vees, Henri Crolla, Jacques Montagne (Mala), Joseph Reinhardt, Gusti Malha, Leo Slab, Lousson Baumgartner, Didi Duprat. 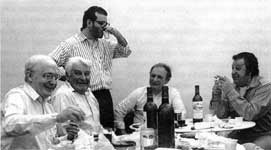 The Fourth Generation, late 1980’s to the present: Jimmy Rosenberg, Samson Schmitt, Dino Mehrstein, Yorgui Loeffler, Dallas Baumgartner, Mundine Garcia, Rocky Garcia, Rocky Fallone, Noe Reinhardt, Moreno, Angelo Debarre, David Reinhardt, Mano Drey, Kussi Weiss, Tchocolo Winterstein, Doudou Cuillierre. Again, this list is by no means exhaustive, just enough to give you an idea as to who came onto the scene at what time. You should also be able to tell, by where the players come from, who their teachers were. You can begin to draw a picture of how the music was handed down through the generations. Eugène Vées was among the most loyal of all Django’s rhythm guitarists. He performed regularly with the maestro from around 1936 until 1947. 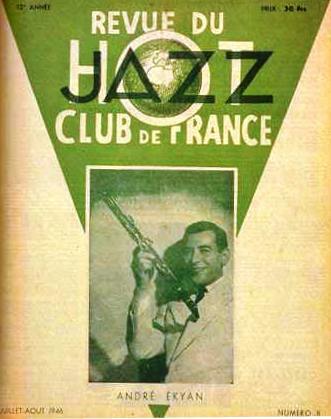 A simple, superstitious, naïve, Manouche gypsy, he never truly came to terms with the “outside” world and preferred the flea-markets and caravan sites to the sophistication and professionalism his membership of the Quintet of the Hot Club of France offered. Eugène “Ninine” Vées was either the 1st or 2nd cousin of Django (reports vary) and was born in 1915. It has been claimed that he was one of the many gypsy banjo players who was sent along to deputise for the young, unreliable Django at the bal-musettes and night clubs when the latter inevitably did not feel like playing but there is no tangible evidence of Vées involvement with Reinhardt until the mid-30’s. 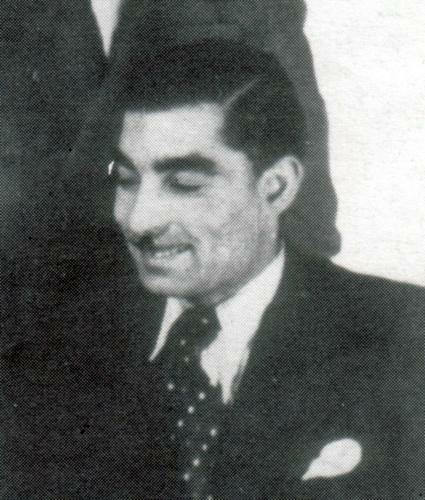 Eugène Vées died in 1977 and could possibly be best described as a session swing rhythm guitarist who is somewhat peripheral to the gypsy jazz story. His input during the pre-war string quintet days is difficult to determine as there was always another rhythm guitarist present. 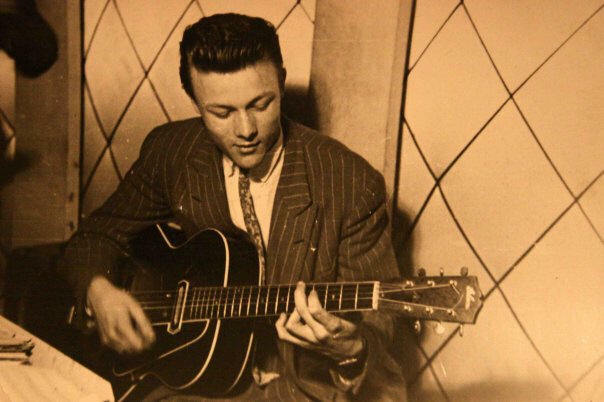 Rene Thomas playing guitar dates from the beginning of the 40’s, with Gaston Houssa Orchestra. His guitar was a kind of “folk” acoustic guitar. For his first recordings in 1943 with Hubert Simplisse, Thomas was really inspired by Django until the end of the 40‘s, and it seems that he played very well in this style : Django himself was impressed by him when they met in Brussels in 1947-1948. René Thomas was born 25 February 1927 in Liege, Belgium. Although considered as one of the greatest jazz guitarists of the 60’s he has remained rather unknown to the general public. After the 2nd WW he played with the “Bop Shots”, Belgium’s first Be-bop outfit with Jacques Pelzer and Bobby Jaspar. Between these 3 men a real musical osmosis arose. In the early 50’s René Thomas moved to Paris where he connects with the modern jazz scene. In the 1930s and 1940s there was a left handed guitar player, René Didi Duprat, who wasn’t a manouche, a gypsy, like many French guitar players, but a gadjo, which means in the Sinti-language, that he isn’t a gypsy. He was a great accompanist at the guitar and played with great musicians, like Tony Muréna and numerous others. George Lankester wrote an article about this unknown French guitar player, titled René Didi Duprat, that was published in Dutch. Today you’ll find the English version René Didi Duprat – Maitre de Musette. “Didi” was born on the 12th of October 1926 in Paris. As a kid he learned to play the mandolin and the banjo, but the guitar would soon become his major instrument. Django Reinhardt was his inspiration and soon he played with important manouche guitarists. At 16 he played in the Michel Warlop Orchestra and in 1943 he accompanied Gus Viseur, the most important accordion player in those days and also with Tony Muréna, another accordion player with whom he played in the parks and streets of Paris, when he was a kid. 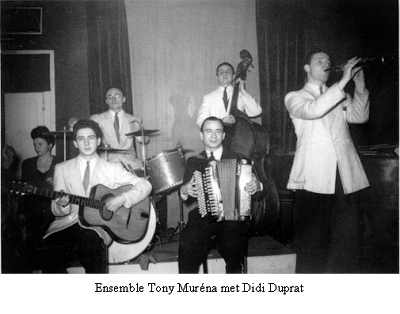 He performed with the Orchestra of Louis Ferrari, yet another accordionist and bandleader, until 1952. He became a friend of Marcel Azzola, a well known musette player in those days. In 1958 Didi replaces guitarist Henri Crolla in some tours of the famous singer Yves Montand and it brings him some fame. He becomes a sought after accompanist for musicians like Dalida, Juliette Gréco and Marléne Dietrich until the mid 1970s. People who enjoy Hot Club Jazz will like to know that the left-handed guitarist Didi Duprat, is to be heard on several recordings of the late 1930s and 1940s, in recordings with Musette musicians like Muréna. It is remarkable to learn that he also played with musicians like Gus Viseur, the accordion player who was so famous because of his swing and improvisations. His records were released on the Swing label. Didi also played with the Ferret brothers, guitarists that were famous too. Early 1990s, not long before he became ill, he was at the Paris Musette CD recordings as an accompanist with musicians like Louis Corchia, Lassagne and Azzola. Although he was to be heard as a soloist now and then, here he was a much appreciated and skilled accompanist, together with Didier Roussin, a great connoisseur of Musette. On two CDs, “La Lichére” and “Vent d’Automne” (Frémeaux LLL 137 and 207) you can find tracks with traditional manouche jazz tunes, but also waltzes, mazurka’s and the Parisian Java. Short after these recordings some great musicians like Jo Privat and Didier Roussin passed away. On the 8th August 1996 René Didi Duprat died, remembered as an amiable musician, who was labelled in France as ‘Maître de Musette’. Django’s first son was is a much less well known personality. Lousson was born to Django’s 1st wife, Florine “Bella” Mayer but Django had already separated from Bella before his birth. It appears Django was not at all involved in Lousson‘s upbringing and since the latter remained a nomadic, somewhat unsociable individual all his life, there is very little information available about him. With this largely unsung talent Lousson never recorded commercially as this excerpt reflects..
Henri “Louson” Baumgartner brother to Babik Reinhardt also played guitar and recorded the “Concert De Bruxelles” in 1948 with Django, Hubert Rostaing, Louis Vola and Arthur Motta. Performed regularly in Paris bars throughout the 1960s but never recorded commercially. Lousson’s style was electric and modern. He died in 1992. Jacques “Piton” Reinhardt’s playing was fast and furious, his style robust and rustic, sounding almost like bebop in the intensity with which he played Django’s classic repertoire. Unfortunately, Piton never recorded commercially, and only a handful of private recordings remain. Friends remember him as such a devotely “uncivilized” Gypsy that he couldn’t deal with the cultured outside world. Here, cradling his well-travelled guitar made by luthier Jacques Favino, he smiles between tunes at La Chopes des Puces in 1966-67. Piton’s sons, Coco and Samson, play today. Manouche Piton Reinhardt played a fierce and fast guitar, making music with a savage charm but played with the ferocious energy of early bebop. Piton was said to be so undomesticated and fiercely a Gypsy that he could not function in the gadjo world. 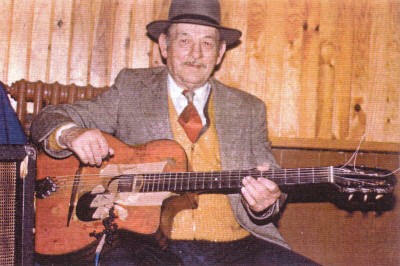 Photos of him show a stately man behind a graying mustache picking out his song on a battered guitar made by luthier Jacques Favino. Piton’s sons, Coco and Sanson, learned at their father’s side and were also renowned musicians. Gitans Jacquet and Cérani Mailhes and Manouche Savé Racine who was married to Django’s cousin Carmen Ziegler also never recorded commercially. A comrade of Piton’s, Spatzo Adel played guitar, violin, and piano. Among the most famous of this lost generation was Jacques Mala, who took the nom de jazz “Jacques Montagne” in honour of an earlier Gypsy guitar genuis, Jacques “Montagne” Mailhes, the nickname meaning simply “mountain” or the summit, the best. This 2nd Montagne accompanied Joseph, Baro, and others of the elder generation, serving as a connection between the two. He even fretted his guitar with just 2 fingers in an attempt to replicate Django’s sound. Montagne was primarily fired by Django’s bebop, fashioning a hard-edged jazz. After Baro’s retirement from the underworld, Montagne took over his “accounts.” One day when the heat got too close, he simply disappeared for his own good. In the 1990s, he was still hiding from the gendarmes and thus, the mainstream jazz world. Out of la Zone during the Occupation came another Romany child prodigy, much as Django had appeared years before. 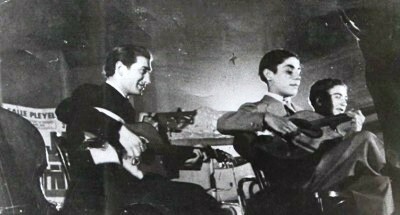 14-year-old Jacques Malha (above Right), and was know as “Montagne”-mountain, so-named as the pinnacle of guitar playing. Following Charles Delaunay’s suggestion, Montagne joined forces with Polish Jew, Leo Slabiak, a classically trained violinist newly converted to jazz. Their band, dubbed the Swing Quintette de Paris, immediately won one of Delaunay’s jazz competitions and was a hit on the Paris scene. Yet Montagne was growing up to fast, smoking cigarettes, chasing woman, and living the jazz life to its fullest. Leo Slab recalled that the war and jazz turned Montagne into un petit animal sauvage. In 1942, two years after his arrival, Montagne died at the age of 16 of galloping consumption (TB). He was buried with his guitar nestled beside him in his coffin. For his part, Slab was snatched during a concert tour and conscripted by the Vichy army. He later escaped, and joined the maquis, trading in his violin for a machine gun for the remainder of the war years. Auguste “Gusti” Malha was another, a banjo and guitar player who accompanied the accordionists in Paris’s bals musette dancehalls with such virtuosity it was as if he had 6 fingers on each hand. Django, the young gypsy learned from Romany players Auguste “Gusti” Malha and Laro Castro, both virtuousi on the banduria, a flat-backed Spanish mandolin.